The 28-year-old German-American Daniel moves into his dead grandmother’s flat. The neighbors – an appropriately weird bunch inhabiting a once grand but now down-at-heel building (as befits a psycho-thriller) – soon awake his memory of a past crime. Especially the room at the end of the hall exerts an increasing pull on him. The second part of the film tells Daniel’s story in flashbacks. He has separated from his wife and takes some time out in Tangiers, where he meets a prostitute with whom he forms a relationship. Soon, she and her young son move into his holiday home. But then Daniel brings home an Austrian who subsequently murders the boy. Amazingly, the killer wheedles himself out of the situation and escapes. Daniel’s values system and perception of the world are shattered, and so it comes, together with his awakening sense of guilt, to a third act catastrophe. 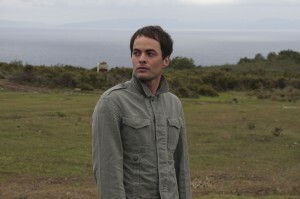 Nikolai Kinski, who plays Daniel, found the character of a man who is caught between all stools and is wrecked by his own powerlessness, to be tailor made. In addition to which, Kinski is able to speak German with an American inflection. This permanent auditory evidence of his rootlessness, his lack of a “Heimat” as Germans would say, was invaluable to understanding the character. And co-star Katharina Schuettler has put in many a stunning performance and is a proud holder of the Foerderpreis junger deutscher Film and was voted the Theater heute Actress of the Year 2006.